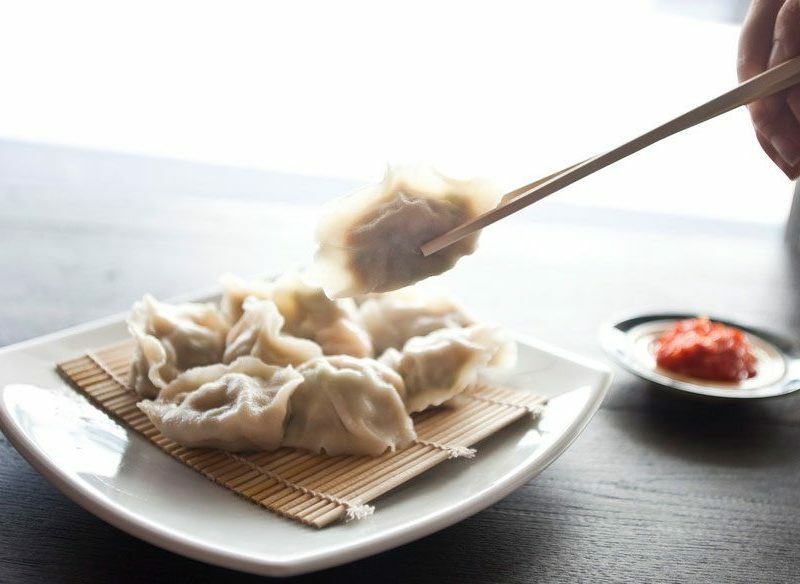 Fat Dumpling is all about plates of plump, translucent jiaozi served poached, steamed or pan-fried. Keen to explore beyond the typical pork and cabbage filling? Poached or grilled, tightly packed with all things sweet or savoury, there’s a lot to love about the humble dumpling. Be it soupy xiao long bao or perfect little potstickers, you can never stop at just one. Chopsticks at the ready: we’re going on a great Brisbane dumpling quest. Walk through the door to a raucous chorus of “irasshaimase!” and you know you’re in the right place. We have a lot to thank dumpling veteran Harajuku Gyoza for. Get your fix of crispy-bottomed duck gyoza, or the genius Nutella-banana combo in South Bank, Albert Lane, Indooroopilly, or at the original Fortitude Valley izakaya. Try chicken and asparagus! Fat Dumpling’s sibling Mi + Mian is just a bao’s throw away in the utterly charming Bakery Lane if you’re in the mood for fluffy lu-bao (pan-fried pork buns). This isn’t your run-of-the-mill yum cha. With an enviable outlook over the Brisbane River, Madame Wu takes your dumpling experience to the next level. They might not be the hero of the menu, but with fancy fillings like wagyu and Jerusalem artichoke, pan-fried scallop and Moreton Bay bug, the dumplings here are something else. Take the stairway to heaven in the super-chic Wintergarden and you’ll be rewarded with an endless array of specialty dim sum crimped by the hands of a resident dumpling master. One basket of the steamed pumpkin and ginger gyoza and you’ll happily become a permanent citizen of the Dumpling Republic. If you like to see gow gee wrappers nimbly stuffed and pleated before your eyes, make a beeline for New Shanghai, which totally nails the Hong Kong teahouse aesthetic. Among their dumpling delights, the shepherd’s purse and pork wontons and crab meat xiao long bao (soup dumplings, for the uninitiated) are standouts. Vegans rejoice! Everybody deserves to experience the pure joy of dumplings. Zagyoza understands this and caters accordingly. The casual West End dumpling joint likes to experiment with quirky flavour profiles including Tokyo curry, chicken teriyaki, and, for our vegetarian friends out there, pumpkin feta. Try Gyoza Bar ANN, Bamboo Basket, Taste Gallery, Landmark, Sono, Taro’s or Yum Yum Gyoza House.